With its air purifiers, water purifiers, security sensors and other home appliances on the Chinese market, it's no secret that Xiaomi has an ambition to not only own the smartphone space, but to also litter its brand around our living space. A bit like Ikea and Muji, for the latter part: Cheap, but with good design and quality. Hence the launch of the Mi Induction Heating Pressure Rice Cooker today, because what better way than to enter every Chinese household with an affordable yet high performance rice cooker, let alone one that works with an app? Priced at just 999 yuan or about $150, this rice cooker is scarily cheap -- about four to five times cheaper than its Japanese rivals like Zojirushi, Toshiba and Tiger. In general, pressure cooking has the advantage of preserving the foods' vitamins due to the trapped steam, as well as speeding up the cooking process with a higher temperature. In Xiaomi's case, its smart pressure rice cooker uses 1.2 atm to push the temperature up to 105 degrees Celsius or 221 degrees Fahrenheit. 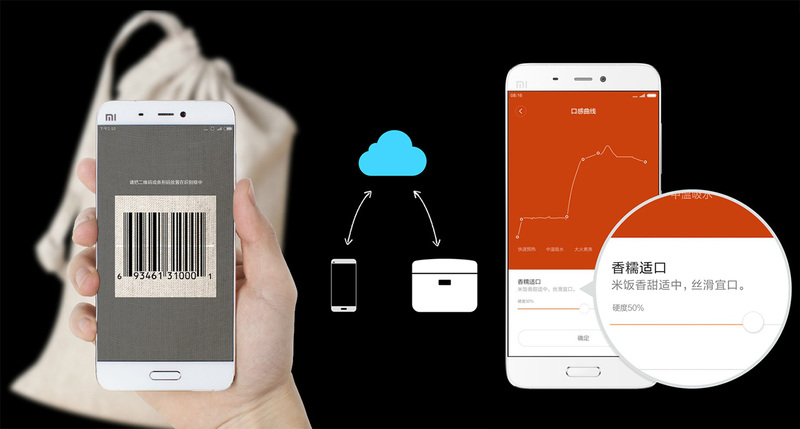 Then there's the companion app that lets you scan the barcode on the rice packaging, and the device will know how to cook it just right, according to the rice type, brand, origin and your preferred softness. There's no word on how many types of rice have been categorized by Xiaomi, but it did mention a portfolio of over 200 brands along with 2,450 combinations of cooking methods for this rice cooker. Despite the price tag, Xiaomi claims that it didn't cut any corners here: The rice cooker comes with a grey cast iron inner pot which apparently doesn't come cheap, in order to achieve optimal regenerative heating and also to ensure the rice is evenly cooked. The pot's non-stickiness is courtesy of Daikin's Neoflon powder coating as opposed to similar chemicals from no-namers, so that's also one less feature to worry about. The Chinese company went as far as hiring Naito Takeshi, a former Sanyo engineer and co-inventor of the IH pressure rice cooker, to lead the development of this project. At today's launch event, Naito is quoted as saying that he wants to "make a better rice cooker, and then sell it back to Japan." The other news here is that this rice cooker is actually the first of the many products to come out of Xiaomi's new sub-brand, Mi Ecosystem (aka "Mijia" in China, which literally means "rice home"). But as with many Xiaomi products, we have a feeling that this device won't be leaving China any time soon, but you can try hitting up a local friend when it becomes available on April 6th.